Sportsgirl in Australia has had considerable media coverage this week with its so called Window Shop in Chapel Street Melbourne, the first of many interactive shopping billboards the clothing retailer plans to erect in various locations. 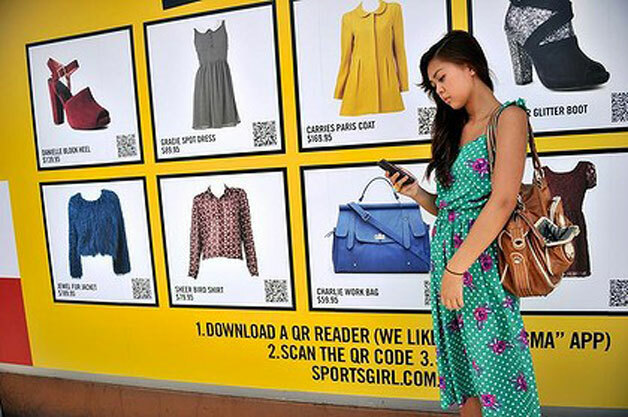 The billboards feature images of key fashion items that consumers can purchase by scanning the items barcode with their iPhone. What I like about Sportsgirl’s approach is the mindset that is driving it. They have stated their intention is to get online to meet offline in a completely symbiotic way. It is the only way to go. The successful retailers have always tried to master the craft of having the best the retail sites. They have over the years spent huge amounts of dollars using sophisticated modeling to generate better predictive capability around the characteristics of the best store sites. Location, location and location, has always rightfully been taken very seriously. The need to adopt the same appetite for the virtual location. The quickly expanding new horizon, and for many a seemingly wild frontier, is to how to translate the advancement in mobile technology to the next manifestation of location, location and location. It requires embracing a new form of consumer segmentation, in this case purchase format preference. And the term being used for shoppers with a preference to shop with a mobile device, is moppers (well, what else could it be). Last year Facebook reported that about 200 million of its 500 million members worldwide access the site via mobile devices. And these users are twice as active as those who use their home or work computers. As we all know if traditional retailers do not cater for this segment it will be filled by specialist online outfits. Online UK clothing site Asos ( whose name stands for ‘as seen on screen’ ) last year was the first European fashion retailer to open an e-tailing outpost inside Facebook. While traditional retailers use the network site largely to communicate with fans, where as visitors to Asos store on facebook can shop the company’s entire stock of 150,000 products without leaving the site. Retailers need to adopt a challenger mindset, because that is precisely what their new competitors have! Nike’s latest Brazilian campaign is another great example of the brand’s ability to use its brand strength to truly connect with people at a local level.